Dimensions: The overall size is 79 inches (2 m) tall and the basic structure is 103 inches (2.6 m) in diameter. From "omni -Z" to "omni +Z" antennae the spacecraft is 131 inches (3.3 m) wide. Mass: The total mass at launch is 1,664 pounds (891 kg) consisting of 1,290 pounds (585 kg) for the spacecraft and 674.6 pounds (306 kg) of hydrazine fuel. Additional Information: The max./min. range for the mass of the S-S/C at impact is max. = 866 kg, min. = 621 kg, and avg. = 743 kg. There are a number of factors that predict this mass at time of impact, including launch day. Power: Power to onboard systems is provided by a fixed 600-watt peak power solar array and a Li-ion battery. A star tracker assembly and 10 coarse sun sensors maintain orientation to the sun. Targeting Accuracy: A targeting accuracy of 6.2 mile (10 km) radius is required, but actual targeting accuracy is expected to be .75 miles (1.2 km) radius. Telemetry: Spacecraft communications are provided through two medium gain antennas operating at 1.5 Mbps (nominal), two omnidirectional antennas operating at 40 Kbps (nominal), and a 7-watt S-band radio frequency transponder. Data: Spacecraft data (engineering and housekeeping) and science instrument data are relayed in real time to the LCROSS mission and science operations teams. Spacecraft Provider: Northrop Grumman Aerospace Systems, Redondo Beach, Calif., and Northrop Grumman Technical Services, Latham, Md. Build: The spacecraft was designed and built at Northrop Grumman's Redondo Beach, Calif., facilities, and the science payload was designed and built at NASA's Ames Research Center, Moffett Field, Calif.
Science Payload: The science payload consists of two near-infrared spectrometers, an ultraviolet-visible light spectrometer, two mid-infrared cameras, two near-infrared cameras, a visible camera, and a visible high-speed photometer. Data from all nine instruments in the LCROSS science payload are managed through a common Data Handling Unit electronics unit. 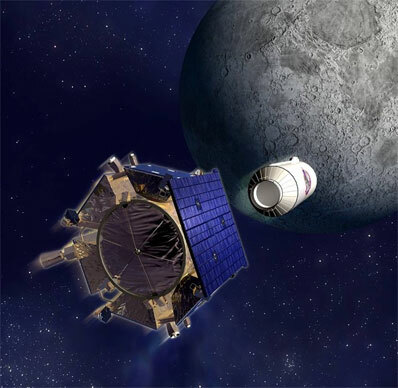 Mission Duration: The LCROSS mission is a three-month to seven-month impactor mission to a permanently shadowed crater near one of the moon's poles depending on the time and date of launch and target crater. Operations: Mission and science operations for the LCROSS mission are located at NASA Ames Research Center, Moffett Field, Calif.
Project Cost: The LCROSS mission costs $79 million plus additional funding from the Lunar Robotic Precursor Program to cover the delays in launch from October 2008. Dimensions: The Centaur rocket is 41.6 feet tall (12.68 m) and 10 feet in diameter. Attached to the LCROSS spacecraft, the stack measures 47 feet (14.5 m). Mass: The total mass of the Centaur at impact is at most 5,216 pounds (2,366 kg). Separation: The Centaur and Shepherding Spacecraft will separate approximately nine hours and 40 minutes before Centaur impact at a height of about 54,059 miles (87,000 km) above the surface of the moon. 180 degree Maneuver: After separation from the Centaur, the Shepherding Spacecraft will perform a maneuver to create separation from the Centaur and orient the science payload toward the moon. Timing: The Shepherding Spacecraft will impact the lunar surface four minutes after the Centaur impact. Speed: At impact, the Centaur and Shepherding Spacecraft will be traveling approximately 1.55 miles per second (2.5 km/s). Angle: The vehicles will impact the lunar surface at approximately 60-70 degrees to the lunar surface. Mass of Impactors: At impact, the Centaur will range from a minimum of 4,958 pounds (2,249 kg) to a maximum of 5,216 pounds (2,366 kg). Nominal impact mass for the Centaur is 5,081 pounds (2,305 kg). The range for the impact mass of the Shepherding Spacecraft is a minimum of 1,369 pounds (621kg) to a maximum of 1,909 pounds (866 kg). Impact Sizes: The Centaur impact will excavate greater than 350 metric tons of lunar material and create a crater 66 feet (20 m) in diameter to a depth of 13 feet (4 m). The Shepherding Spacecraft impact will excavate an estimated 150 metric tons and with a crater 46 feet (14 m) in diameter to a depth of 6 feet (2 m). Plume Height: Most of the material in the Centaur debris plume will remain at (lunar) altitudes below 6.2 miles (10 km). Target Crater: The current target location is a permanently shadowed crater near the south pole. Final determination of the target crater will be announced 30 days before impact. The target's pole is determined at launch. Observation Campaign: Professional and amateur astronomers are working with the LCROSS science team to coordinate the observations of the dual impacts of the LCROSS mission. Earth's closest neighbor, the moon, is holding a secret. In 1999, hints of this secret were revealed in the form of concentrated hydrogen signatures detected in permanently shadowed craters near the lunar poles by NASA's Lunar Prospector. These readings may be an indication of lunar water and could have far-reaching implications as humans expand exploration past low-Earth orbit. The LCROSS mission is seeking a definitive answer. In April 2006, NASA selected the LCROSS proposal for a low-cost, fast-track companion mission, scheduled to launch in 2009. The main LCROSS mission objective is to confirm if and in what form water may exist in one of these permanently shadowed craters. LCROSS is scheduled to launch with the LRO aboard an Atlas V rocket from Cape Canaveral, Fla., in 2009. After launch, LRO will separate from LCROSS and continue on to the moon. The LCROSS (shepherding) spacecraft will retain the Atlas V's Centaur upper stage rocket and use it as the primary impactor for the mission, something that has never been done with a Centaur. After sufficient distance from LRO is achieved, the shepherding spacecraft and the Centaur will perform a "blow-down" maneuver to vent any remaining fuel inside the Centaur to help prevent contamination of the impact site. Five days later, the shepherding spacecraft and the Centaur will execute a flyby of the moon and enter into an elongated Earth orbit to position LCROSS for impact on a lunar pole. This elongated orbit portion of the mission is expected to be four months. The exact length of time is dependent on the exact time of launch and is calculated to satisfy a number of competing mission constraints, including hitting a specific target crater, timing the impact to achieve proper illumination of the debris plume at the time of impact, and staying within spacecraft propellant limits. On final approach, LCROSS and the Centaur will separate. The Centaur will act as the first impactor to create a debris plume with some of the heavier material reaching a height of up to 6.2 miles (10 km) above the lunar surface. Following four minutes behind, the LCROSS will fly through the debris plume, collecting and relaying data back to Earth before impacting the lunar surface and creating a second debris plume. Lunar orbiting satellites and Earth-based telescopes on the ground and in orbit will observe the impacts and resulting debris plumes. The impacts are expected to be visible from Earth using telescopes 10-to-12 inches and larger. Data from these multiple sources will be used in preparation for the eventual return of humans to the moon. The LCROSS science payload consists of two near-infrared spectrometers, a visible light spectrometer, two mid-infrared cameras, two near-infrared cameras, a visible camera, and a visible radiometer. The LCROSS instrument payload was designed to provide mission scientists with multiple complementary views of the debris plume created by the Centaur impact. As the debris plume rises above the target crater's rim, it is exposed to sunlight and any water ice, hydrocarbons, or organics will vaporize and break down into their basic components. These components primarily will be monitored by the visible and infrared spectrometers. The near-infrared and mid-infrared cameras will determine the total amount and distribution of water in the debris plume. The spacecraft's visible camera will track the impact location and the behavior of the debris plume while the visible photometer will measure the flash created by the Centaur impact. LCROSS is a fast-paced, low-cost, mission that leverages select NASA flight-ready systems, commercial-off-the-shelf components, the spacecraft expertise of Northrop Grumman Aerospace Systems, Redondo Beach, Calif, and the experience gained from NASA's Lunar Prospector mission. NASA Ames Research Center, Moffett Field, Calif, is managing the mission, conducting mission operations, and developing the payload instruments, while Northrop Grumman designed and built the spacecraft for this innovative mission. Ames mission scientists will spearhead the data collection and analysis. The moon is the most prominent object in our night sky yet more is known about Mars than the most parts of the moon. What is known about the moon is gathered by Earth-based telescopes and from the Apollo missions and small lunar robotic missions. In the 1990s, two of these small robotic missions, Clementine and Lunar Prospector, found evidence of possible water ice at the lunar poles. Unfortunately, the evidence is not conclusive. The LCROSS mission seeks a definitive answer to the question of lunar water. If water is present, it could present a valuable resource in the human quest to explore the solar system. Confirm	the	presence	or	absence	of	water	ice	in	a	permanently	shadowed	region	on	the	moon. Identify the	cause	of	the	hydrogen	signatures	detected	at	the	lunar	poles. Determine the	amount	of	water,	if	present,	in	the	lunar	regolith	or	soil. Determine the	composition	of	the	regolith	in	one	of	the	moon's	permanently	shadowed	crater. The LCROSS mission will be the first in situ, or in-place study, of these pristine permanently shadowed craters. The primary goal of LCROSS is to measure the concentration of water ice (ice to dust ratio) in permanently shadowed lunar regolith or soil. When the Centaur, weighing up to 5,216 pounds (2366 kg) or about the weight of a large sports utility vehicle, impacts the floor of a permanently shadowed crater at 1.55 miles per second (2.5 km/s,) there is an initial flash followed by the creation of a debris plume. If water ice is present on the floor of the crater, it will be thrown skyward. Once above the crater rim, it will be exposed to solar radiation breaking the molecules of water into hydrogen ions and hydroxyl ions. The LCROSS spacecraft, following four minutes behind, will collect and transmit data back to LCROSS Mission Control about the debris plume using the nine onboard science instruments before impacting the surface. A possible result of both of the impacts is the creation of a temporary thin atmosphere of hydroxyl ions. This resulting atmosphere could be detectable using telescopes on and orbiting the Earth and satellites in lunar orbit.